For a UTV owner, there is nothing handier, more convenient or appreciated, than a place to quickly store and transport gear and tools. Truth is, though, Great Day's Front Rack is more than a hauling device. 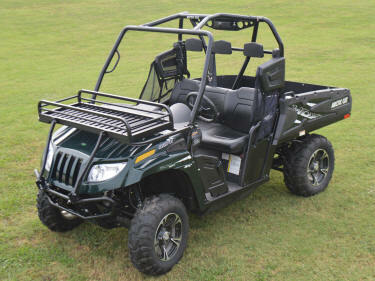 With its handsome but rugged design, the Front Rack actually transforms a wimpy-looking UTV into a machine with an attitude and ability. 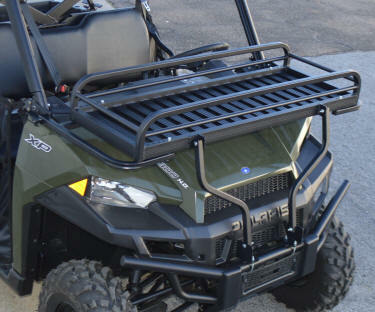 The Front Rack mounts quickly and easily onto most full-sized UTV's and features a unique pivoting mechanism for gaining access to the front storage compartment. By removing two quick-clip pins, in just seconds the Front Rack can be rotated forward - allowing the storage compartment door to be opened and closed. The Front Rack is constructed of aircraft aluminum and provides an 18" x 50" x 7" carrying cradle with multiple tie-down points. A super-tough, sleek, powder-coat finish on the Front Rack gives it good looks and insures lasting quality. The Front Rack weighs only 14 lbs, has a load limit of 250 lbs and shops by UPS. MADE WITH PRIDE IN THE USA!